Notice Uncle Leo hiding behind the guitar in the picture above. Powerless – this is more musical microblogging, very much in the spirit of Hector & Achilles, but with better software. I’m not sure if it’s a better result. 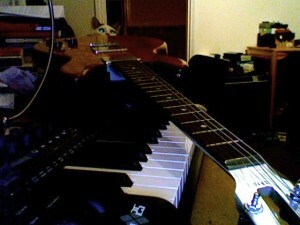 Anyway, the goal was to get both Guitar Rig and Reason running through Logic. That worked great, except I couldn’t quite figure out how to use the Logic instruments without triggering the Reason stuff. And the video tutorial I was working from sucked, so there was still a lot of trial and error. And Uncle Leo kept walking on the laptop – big surprise there. So this is a pair of Dr Rex rhythms coming through Reason (first one then both patterns), acoustic piano from the Reason NN-19 sampler (but using reverb and chorus from Logic) and a Thor patch called Alan Turnig’s Dream, also through Reason. Guitar was supplied by my old Travis Bean, still in need of some cosmetic repair work. Sadly, it was too late at night to run live out of the Lab Series amplifier, so I settled for a cheezy preset from Guitar Rig. You have to hand it too Native Instruments, even the feedback from the Bean’s high output humbuckers is faithfully modeled. Basically this is supposed to be a Vox AC-30 (2×12) with a bit of delay. I don’t like these digital models for guitar, but they are damned convenient, especially after hours. All other sounds were played on the Axiom 25 keyboard, which had to have its first hard reset because when I started all but three of the keys were non-functional. Fortunately the reset solved that problem. Hopefully there is decent volume. My old GarageBand efforts are usually pretty quiet. This may be quiet too because the meters on Logic weren’t peaking. To my ears, though, it sounds OK. I haven’t tried to automate any panning or really doing anything left-right at all. Sorry – no spacial dynamics this time. I try to learn that as I get more comfortable with the recording, mixing and mastering. This was really just an exercise, but I’m very pleased about it’s faithfulness to the original musical microblogging concept from Fretbuzz.net – almost exactly one minute.